With the zero-waste challenge underway, and our goal to generate no trash for the month of July, we were determined to succeed. Our first hurdle? Grocery shopping. A fresh waft of fruit and veggie air greeted us as we stepped into Hannaford. 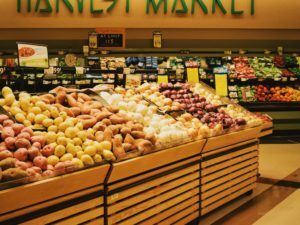 The supermarket carried a surprising variety of zero-waste options: sweet potatoes, onions, mushrooms, tomatoes. Gleaming near the entrance was a regal mound of bananas, its golden goodness impossible to pass up. But as we approached, we noticed a thin non-recyclable band wrapped around their torsos: these were organic bananas. It’s a surprising irony that organic foods require additional and often wasteful indicators like stickers and bands. 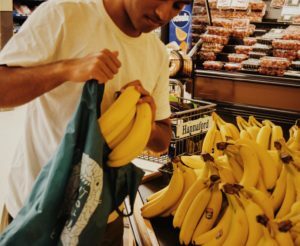 Choosing the bandless ones, we were mindful of the fact that we were potentially supporting corruption in the non-organic banana industry, and began to question whether shopping for zero-waste would actually lead us to make more ethical or sustainable choices. At the veggie rack, Neil reached for a large handful of sugar snap peas, only to realize that the only thing to put them in was a plastic produce bag nearby, a zero-waster’s worst nightmare. “You could just plop them on the conveyor belt when we check out,” I offered. But he was understandably reluctant to place the exposed veggies on the dirty conveyor belt, and replaced the peas. Alternatively, we could’ve brought reusable produce bags, but such solutions require proper resources, preparation, and forethought, which we didn’t exactly have at the get-go. Our next stop was the cheese section. Surveying our options, we noted that they were all wrapped in soft non-recyclable plastic. Even when we found a hard plastic package, we realized there was a thin film at the bottom, as per FDA regulation. Indeed, the fact remained that none of the cheese packages were completely recyclable. Next, we passed the snack and cereal aisle. 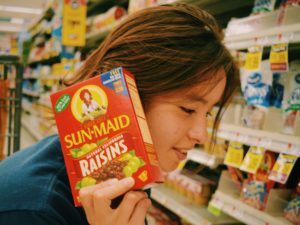 By the raisins, I picked up a box that might’ve passed for zero-waste, except for the sound of crinkling plastic. “Listen,” I said, shaking the box. “You can hear the plastic inside.” Someone strolling by with their cart glanced at us, probably bewildered by our intensity and documentation. “But it’s much cheaper and faster to just get the pre-packaged stuff,” I replied, disappointed. In fact this is exactly what companies have marketed to us since the rise of consumerism in the 1950s: convenience and disposability. But sending to a landfill or incinerator was the last thing we wanted to do while going zero-waste. Understandably, pressures of time and money make it hard on many families to make the same commitment to zero-waste. But why should we as environmentally conscientious consumers be forced to deal with this dilemma? If only we didn’t have to resort to disposability based on what was sold in the store. What if instead we could rely on companies to design packaging for reusability, recyclability, and compostability that is just as convenient and accessible? “But does Hannaford collect flimsy plastic for extended recycling?” Neil asked. Neither of us had noticed a collection station, but recalled that PLAN had set aside a portion of its office space to collect materials for expanded recycling: used toothbrushes, styrofoam, and soft filmy plastics. In general, though, if we didn’t have access to an expanded recycling center, we’d steer clear of flimsy plastics, which can’t be recycled in traditional facilities and are therefore not collected in curbside bins. Here was the conundrum we faced: would buying the pre-made dough in a plastic bag generate less waste than buying individual ingredients to bake the dough ourselves? Was it more important that we prepare dinner quickly or with the least amount of waste? If only the two were compatible goals. And what about energy considerations? Would our oven use more energy than a factory used to make our dough? But since the concept of zero-waste technically applies only to material resources, we kept our debate to packaging trade-offs and downstream management in landfills and recycling facilities. 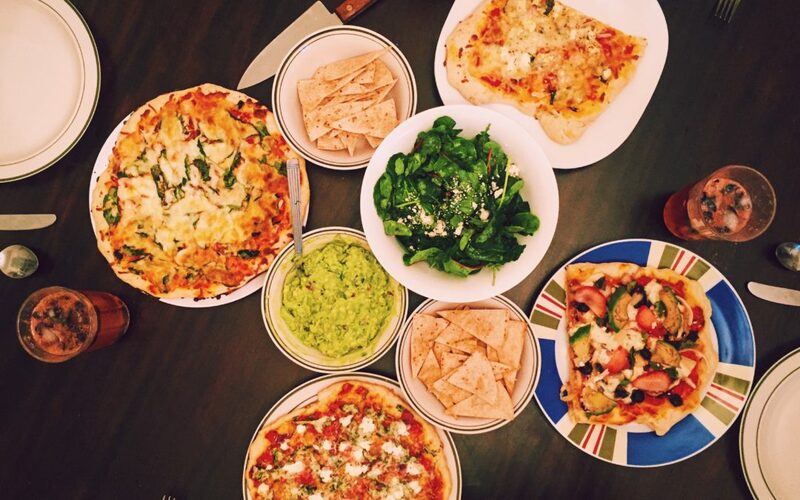 After much deliberation, we decided to bake rather than buy the pizza dough. 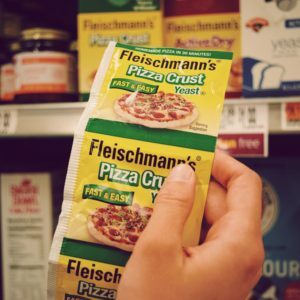 We’d send the yeast package to a landfill, and avoid the thin-film plastic wrap around the pre-made dough. We figured that the wrap would’ve been contaminated with grease that could muck up the processors at an expanded recycling facility. “Plus we have all night, so let’s at least try to bake the dough,” I said. 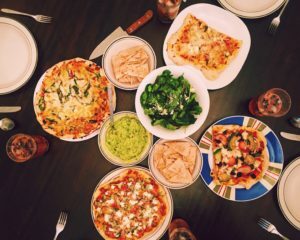 Upon our return from this unexpectedly long shopping expedition, we prepared a family-style pizza meal with our fellow interns. Except for the yeast package, the entire dinner was zero-waste. We did generate other sources of recyclable waste, like the thin plastic of the mozzarella package (later taken to expanded recycling), and the hard plastics around the arugula, basil, and dill. While having to recycle is worse than not generating waste at all, it’s definitely better to recycle than to send to landfill, consistent with the waste hierarchy. 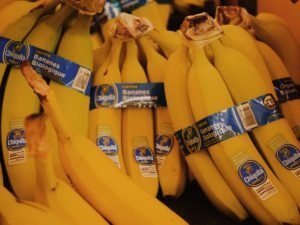 Additionally, our choice of bandless but non-organic bananas in favor of zero-waste was one of many trade-offs that again highlights the movement’s intersectionality with social and environmental justice, ethics, and sustainability. 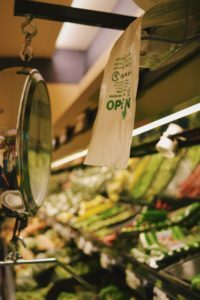 Is it our fault if we “failed” on our first zero-waste grocery shopping trip? Is it our fault if we can’t live a completely zero-waste lifestyle at this point? No. 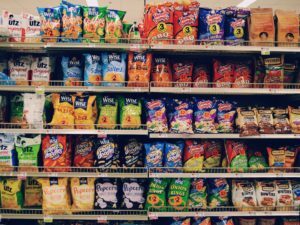 Try as we might to be selective in our purchases, industries are responsible for the packaging that consumers encounter in stores. Because companies don’t widely market compostable or recyclable packaging yet, living a zero-waste lifestyle remains extremely challenging. Realistically, the changes we want to see toward reusable, recyclable and compostable packaging won’t happen as quickly as we hope in upstream manufacturing processes. 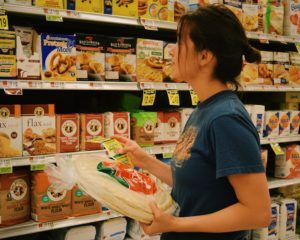 So, for now, we’ll settle with selecting the least wasteful items from the shelves, leaving behind granola, raisins, and many other delicious snacks that we might’ve bought prior to the zero-waste challenge. 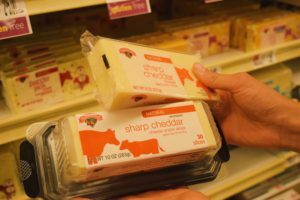 We opted only once to go for slightly more expensive items, choosing the cheese with the most recyclable casing; after all, we’re student interns. 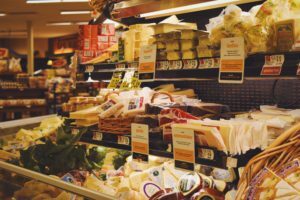 Indeed, lack of income for individuals and families may contribute to the inaccessibility of zero-waste lifestyles on a broader scale, given that cheap disposable packaging currently reigns the global market. Although zero-waste is a difficult thing to accomplish in our society, we can still be conscientious and make changes where possible. Moreover, moving toward a zero-waste society is not all or nothing: everyone’s contribution is valuable. So we encourage you to give it a whirl, and please share your thoughts below! Acknowledgements: Thank you fellow interns and staff for your edits and contributions. Photo credits to co-authors Aldís Elfarsdóttir & Neil Chavan. This post really resonated with me. 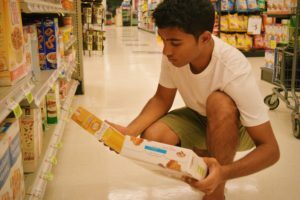 I have been shopping like this – taking into consideration all the pros/cons of types of packaging and the products within them – for a while now. It gets easier with time. I’ve also learned sometimes I need to give myself a break and buy that can of beans. According to google results, the US industry can recycling rate is about 67%. This is a better track record than plastic, which I am much less willing to purchase. About the banana stickers – I thought of the same dilemma! My solution: using the strips as decorative stickers. They make great borders. You can cut them to the length you want if necessary. I covered my laptop in them. It actually works out great as a conversation-starter on zero waste. People notice and ask about the stickers and I explain that I do it to avoid sending the stickers to the landfill. If you want to go even further, you could explain why choosing the organic bananas was worth it to you. Upload attachment (Allowed file types: jpg, pdf, maximum file size: 2MB, maximum Image Width: 2000px). (Allowed file types: jpg, pdf, maximum file size: 2MB. Original content copyright © 2013-2015 PLAN. All rights reserved. | Site developed by GoatCloud.